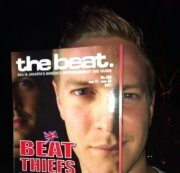 Henry Hacking, one half of UK house duo The BeatThiefs. So to make his venue special we will have the longest Happy Hours in town – from 4pm to 9pm = half price on the drinks menu. Just finished a new remix for Chocolate Puma’s new single and will be working with Jesse Garcia and Moguai over the coming months.